There was an earthquake last night, down near the bottom of the South Island, a 7.8 - proudly described on the news as 'the world's biggest this year' - but we felt nothing up here in Auckland. Though these are sometimes called The Shaky Isles, the last/first earthquake I've felt was the 7.1 Inangahua one in 1968. I was in bed at home in Christchurch, woken early on a dark winter morning by my Venetian blinds swinging and banging against the window frame, and by all the neighbourhood dogs barking as my bed rolled and shook. It was quite a thrill. We used to have earthquake drills at school, when the teacher would suddenly yell "Drop!" and we would all have to scramble under our desks. Once we had it in history, and the sight of short, squat, roly-poly Miss Oliver compressing herself under the teacher's table was much more memorable than any of the dates she tried to teach us that year. After last night's quake, a tsunami alert went out in places like Tasmania and Sydney, but they didn't notice anything much - thank goodness. Even five years after the Boxing Day tsunami, the images are still vivid. I was in Thailand earlier this year, and spent some days on Phuket. It was hard to connect what I saw with what I remembered from all those wobbly phone camera videos. >>> After a lovely day out in Phang Nga Bay, on the way back home our boatie stopped at a deserted beach on another island and we floated in the bath-warm water, trying to imagine how it must have been in 2004 when the tsunami swept through this area. 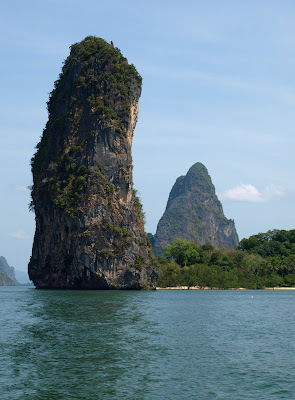 It was an impossible exercise, partly because there's no visible evidence, and partly because Phang Nga is so beautiful that death and destruction simply won’t fit into the picture. It was the same back at Patong Beach, on Phuket itself. We sat in Baan Rim Pa, a fine and famous Thai restaurant where we enjoyed a magnificent multi-course dinner at a table on the veranda, looking down on local families fishing from the rocks below. Out in the bay, lights looped through the dark where the squid boats were working, and a warm breeze made our candles gutter in their holders. Where we sat savouring fresh seafood cooked to recipes once prepared for the royal family in Bangkok’s Grand Palace, where the polished teak glowed warmly in the lamplight and the brass fittings gleamed, a wall of water had swept through on that terrible morning. There was nothing to show for it. Glasses clinked, people chatted and laughed, there was live music from the bar and the air was scented with jasmine and spices. In Phuket today everything is civilised again. Only five years since the tsunami? The images were on the movie I watched last night, "Knowing." I was surprised it was so long ago - it seems more recent to me. Maybe because we talk more about tsunamis here, being so long and thin and most people living near the coast.